Apologies in advance, this entry isn’t as tightly edited as I prefer but I’m still swamped. 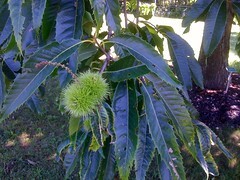 The American Chestnut. Once three billion chestnuts grew in the Eastern US. Reading the wikipedia page today the discovery of individual trees that have survived long enough to flower is worthy of report. The culprit, a bark fungus introduced from Asia. Asian Chestnuts can survive the infection, but American ones had never had the evolutionary pressure to develop ways to survive. Conceptually it’s the same as when people who’ve lived for many generations without exposure are exposed to smallpox, (although if it came down to it, I’d choose losing three billion trees in a second over the millions of people killed by smallpox). As I mentioned above, a few American chestnuts still survive, though either luck of placement or rare alleles that provide some level of resistance to the chestnut blight fungus. But a tree that was a major component of eastern forests, a source of both valuable lumber and delicious food (chestnuts), is effectively extinct within its native range. I know a couple of ecologists who could probably outline the kind of impacts the wipeout had on other species, I’m sure foresters and agronomists could talk about the economic impacts of the species’ absence. Since I’m none of those people, let’s take it as a given that the loss of American chestnuts is a Bad Thing™. The positive side of this story is sometime, within our lifetimes, the story of chestnuts could change from a sad loss to a hopeful story of how we as a species can fix some of the problems we inadvertently created (we brought asian chestnuts to New York City, which carried the fungus and infected the our native chestnuts). As I mentioned, Asian Chestnuts are resistance to Blight, and people are working to introgress that resistance into American Chestnuts. Introgressing is a fancy word for getting a single gene from one genetic background into another. Say you discover golden retrievers contain a mutated form of a gene involved in the ability to digest carbohydrates ( we’ll call this CHDG). You want to see what effect that mutated form of the gene has in norwegian elkhounds. So you mate a golden retriever with a norwegian elkhound. Their offspring are 50% golden and 50% elkhound, and all of them carry one copy of the golden retriever CHDG gene. You mate one of those new dogs with another norwegian elkhound. The next generation is 25% golden retriever and 75% elkhound, but only half the the dogs will carry the golden retriever version of CHDG. Using genetic tests you pick only the dogs carrying the golden retriever version of CHGD, and again mate them with an elkhound. Now the dogs are 87.5% elkhound. Repeating this over and over can create dogs that are almost genetically identical to elkhounds except for the golden retriever version of CHGD. Last year chestnuts that carry the chinese chestnut blight resistance alleles but are ~94% American chestnuts (the result of four generations of breeding to American Chestnuts) were planted in the forests of Virginia, Tennessee and North Carolina. Today many of them are six feet tall and flowering. It will take decades for new seedlings to grow into the towering chestnut trees of the past (150 ft tall and 10 feet thick) but they will come back, thanks to people dedicated enough to breed trees. The four generations required to get a 94% introgression would take two years in corn, one generation each summer and a second in over the winter somewhere tropical (though seed companies can get up to four generations per year with growth chambers and harvesting immature seeds). With dogs it might take 6-8 years. A single chestnut tree can take 6-10 years to flower. Four generations is the result of between 24 and 40 years of breeding. Take a moment to be in awe of the long term planning of the chestnut breeders who are going to give us back a both ecologically and environmentally important species.